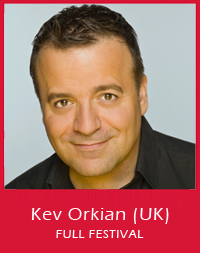 Kev Orkian, London’s top comedic pianist, is back with his funny songs, creative dancing and great humour. Kev is currently on his world tour. Classically trained, Kev’s diverse repertoire is a fine blend of acting, off-beat humour, exceptional musical comedy and classical musical performance – resulting in captivating comedic genius. Kev first performed at the Cape Town Funny Festival in 2011, where he received the most standing ovations of the festival, and has returned a number of times since then.